Traditional #5 - Standard : FlameMasks!, The Original :: Empowering YOUR creative Airbrush needs since 2001! A new and BOLD design...these flames feature a "wide body" licks with skinny tips!! Trad. #5 flames are great used by themselves, or combined with any other traditional flame design I offer for a look all your own!!! 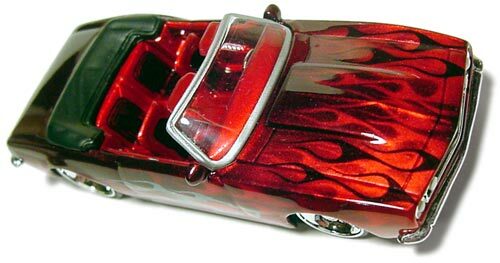 Multiple sets may be placed next to each other or slightly overlapped to create a "wall" of flame or used in combination of inner and outer to achieve effects similar to the Camaro at left!! The flames that appear "black" were done with inner masks, and the lighter red flames were done with outer versions while the "inners" were still applied to the car. There are THREE different designs included. With several different sizes of each!! And TWO that have been rescaled to accomodate different applications. These different designs are indicated by a "SOLID" color in the low resolution example image at top of this page. There are a WHOPPING 58 MASKS included per sheet!! Sheet includes various sizes to fit a WIDE range of different castings!! From large 1/64 scale casts like VW Drag Bus and Dairy Delivery and also masks included that will work nicely on smaller casts such as Nova and Camaro!! Even 4 specially sized masks for use on smaller castings hoods and roofs! And the smallest side flames will fit the upper side panels of a Dairy Delivery cast perfectly..plus..the same sets will work great on the side of smaller castings like camaros! In general, I RECOMMEND New users get the "Inner ONLY" masks WITH FILM!! The inner masks are generally much easier to use AND also make REPEAT usage Much more likely. The "with Film" versions can make transfering the masks to surface easier for less experienced users. However, some may find the application to be just fine using the "NO Film" version, especially those that have used masks previously, who may prefer this method. I STRONGLY Suggest for users that prefer the "outer" masks, choose "outer ~ WITH Film" in order to avoid complications while transfering to the surface. Please choose "application style" from the drop down menu below. Other than those stipulations, I recommend these masks for all skill levels. INNER Masks should be used if you want to paint the FLAME COLOR FIRST, apply the mask, then paint the Main body color and remove mask. These masks can be reused several times if you are careful not to rip or stretch them during removal and store them correctly.